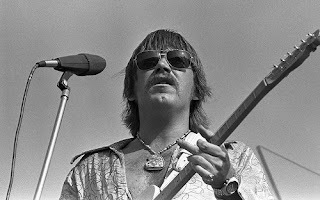 Terry Kath was my favorite rock guitarist. And Jimi Hendrix’s as well, so the story goes. I saw Chicago countless times and would just stare in awe when Terry would solo. Alone for what seemed like forever. A beautiful, exciting forever. The band would leave the stage (doing what I imagine 70’s band folks did backstage) and Sir Terry would wail on that ridiculously-stickered Tele. His wrists were rubber. Exhibit A “Liberation” on CTA. His riffs were Promethean, see “What’s This World Coming To?”, “Hit By Varese,” “It Better End Soon” (off IV). Listen to his acoustic guitar and electric bass on Lamm’s solo “Love Song,” clearly one of the catchiest tunes ever recorded (and on my desert island list). The master of the wah-wah on “Dialogue.” His solo on “25 or 6 to 4” is sui generis and inimitable. What would he sound like today? He has nothing to do with this audio disquisition, but I’m thinking about him constantly. He died tragically, accidentally and stupidly at the age of 31. I wonder what he’d sound like today. He’d be 64. And like all stars and icons and idols who die too soon and tragically, their image always remains in your mind frozen at that age and at that time. And you still see them through your eyes then. Hey nineteen, indeed.